Please Note: Cats must be current on Rabies, FVRCP, & Feline Leukemia vaccinations. 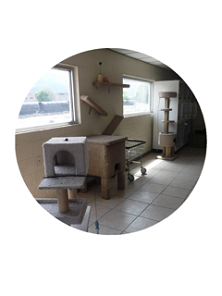 Our feline guests enjoy the home-like setting of our cattery, which includes scratching posts, climbing shelves, boxes, toys, large picture windows, and occasionally warm laundry to lie on. During the day, we rotate cats out of their kennels into the common area in 'family groups', i.e., cats from the same family. When a family group is out, they won't meet any other unfamiliar cats. They have ample time to roam free, climb and explore, or just lounge in the sun. Lots of our feline guests enjoy sunning next to the window and watching the birds peck at the feeder outside. At nighttime, cats retire to their own private kitty-condos, which are bright, spacious 24" x 24", open-faced enclosures. The units have removable pass-thru portholes, allowing us flexibility to combine units together. Thus, cats from the same family can visit each other as desired, while maintaining their private space as well.